Canada Goose is up more than 5% Monday after receiving some positive commentary from Wall Street. Shares gained as much as 30% on Friday following strong earnings. The retailer also announced it’s continuing to expand in North America. Watch Canada Goose trade in real time here. 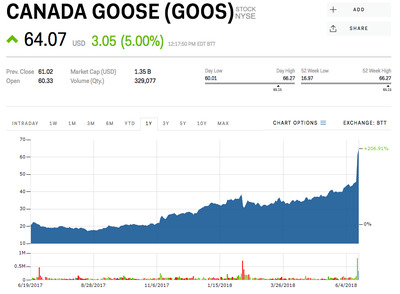 Canada Goose showed impressive earnings Friday, and Wall Street is applauding. Shares are up 5% to $US64.07 apiece after the luxury winter-wear seller received some positive commentary and encouraging valuations from Wall Street. In a note sent on to clients on Monday, Cowen analyst Oliver Chen called the earnings “very impressive,” and noted the company’s guidance of 25%+ EPS growth for 2019. Chen stressed the importance of Canada Goose’s shift to a direct-to-consumer model. DTC sales rose 160% in the fourth-quarter year-over-year, and that trend is set to continue, according to Chen. He raised his price target tp $US63 a share. Monday’s advance comes after shares soared more than 30% on Friday following the retailer’s strong fourth-quarter results. Canada Goose announced earnings of C$0.07 a share, easily beating the $US0.09 loss that analysts were expecting. Revenue came in at C$124.82 million, beating estimates of C$74.6 million. The same day, the company announced in a press release that it plans to open three new stores in North America. The stores will be in New Jersey, Montreal, and British Columbia. Canada Goose went public in February 2017 at just above $US12 per share. The stock has returned more than three-fold since then. And it’s up 206.91% in the past year.